Ron Green had already retired once after a long and successful career in print journalism - including 30 years at the Kent Messenger group - before being persuaded to help out with lecturing our first batch of students just after we had set the department up. In the years since then he has been a stalwart of CfJ life, and many is the student who has benefitted from his patience, his wisdom and the incisions of his red pen through their copy. Dozens owe at least part of their progression through the NCTJ diploma to the many additional hours he put in helping them to sharpen top lines, polish quotes and check key facts. Today, Ron retired once again - fittingly enough after delivering a final session with the first years on preparing for a snap general election. 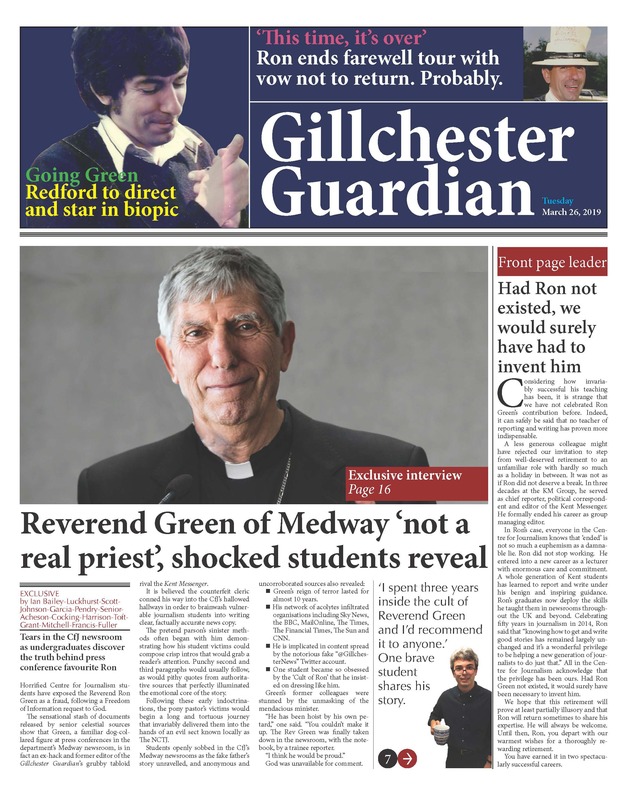 And so we gathered in the newsroom to give him a traditional newspaper send-off - starting with the presentation of this spoof Gillchester Guardian front page to add to his collection - and finishing with one of the industry's oldest practices: the banging out ceremony.